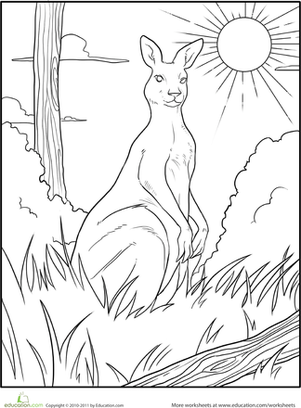 Hop into this kangaroo coloring page. Kangaroos are a favorite for kids because of their unique look and movement, and they are a national symbol of Australia. Color a tender scene between a mama kangaroo and her joey. Color two young kangaroo bucks, ready to cause some mischief! This baby kangaroo must hop through a maze to find his mother! Can your child help? She'll be honing her fine motor skills and practicing problem solving. This coloring page features kangaroos, including a joey, a baby kangaroo, for your kids to strengthen fine motor skills as they color. Have your young animal lover color in this curious kangaroo that has taken a break from hopping to take a look at his surroundings. 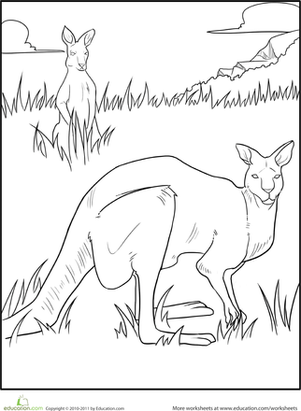 Travel to the Australian outback with this kangaroo coloring page. Put some bounce back in this kangaroo's step! Share a fun, recycling arts and crafts project with your child, and create your own paper bag puppet. If you only recognize this creature as the "fatter, scrunched-down version of a kangaroo," then you should check out this worksheet. Help him discover more about the kangaroo, the national animal of Australia and a favorite of zoo-goers everywhere. Your child might not often get to see a kangaroo, kiwi or platypus, but she'll learn about a few Australian animals and the tracks they leave behind!